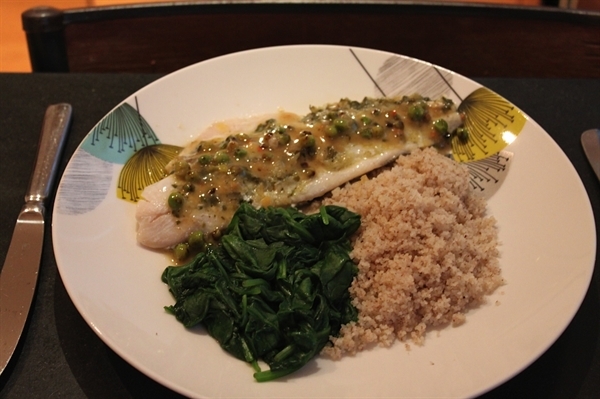 4) Set the fish into a baking dish, and spread the pesto over the fish, cover with foil and bake for 15 minutes. 6) Saute the peas until browned, then add the cooking juices and wine, and reduce. 7) Wilt the greens and mix through the cumin. Serve the fish on the greens and drizzle with sauce. From Maria Koinaki of My Olive Branch, Ruislip, Middlx. From Hillfarm Oils, Hill Farm, Heveningham Halesworth, Suffolk. From Clearspring, Acton Park Estate, London. This non-toasted sesame oil is a general-purpose oil that can be used for cooking and in salads.